December 14th, 2016, Charlottetown – Carly Connell, Kyle Connell, Jenna Larter and Jacob Theriault led P.E.I.’s contingent with gold medal wins at the Charles Gorman Memorial Speed Skating Championships held recently in Saint John, N.B..
Jenna Larter of North Wiltshire captured one of four gold medals for P.E.I. at the recent Charles Gorman Memorial Speed Skating Championships in Saint John, N.B.. Photo courtesy of Phil Matusiewicz. 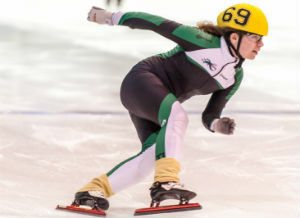 Carly Connell grabbed the Division 1 gold medal for female skaters with seasonal best times in her 500 and 1000 metre distances, while her brother Kyle used wins in his 200 and 400 metre distances to take the Division 2 gold for males. Larter, meanwhile, won the Division 2 gold for females with personal best (PB) times in her 200 and 400 metre distances. Theriault, in just his second season, notched PBs in all of his timed distances and took the win in his 200 metre race to help earn top overall honours in Division 3. Andrew Binns (Division 1), Thomas McQuaid (Division 2), Liam Chatfield (Division 3) and Addison Bruce (Division 5) brought home silver medals for P.E.I. Binns continued his strong season by winning the 500 metre distance and improving on his personal best in the 1500m event, while McQuaid took wins in the 1500m and 3000m points race. Liam Chatfield grabbed the win in the 400m distance and a 1500m PB to earn his podium spot, while Bruce had three personal bests to propel him to his silver medal. Eliana Monthony of Cornwall nabbed the Island’s lone bronze medal, in Division 1, after skating to a new personal best time in the 500m sprint. The P.E.I. team fielded 21 skaters for the competition, which featured 123 athletes from ten Maritime clubs. Also competing for the Island were Rob Binns, Kristen Binns, William Lyons, Carter Bruce, Mia Stewart, Alex Rogers, Zachary Chatfield, Olivia Wood, Jane Bruce, Holly Nickerson, Dennis O’Shea and Declan O’Shea. Will Oliver of Saint John took top overall honours in the meet, followed by Andrew Binns. Misha Boulerice of Fredericton took third. Among female competitors, Carly Connell was followed by Saint John’s Maggie Oliver with silver and by Monthony who finished third overall.